Rail seat abrasion on concrete ties has plagued railroads for nearly two decades, now. Abrasion ranging from less than 0.02 inches to more than 1 inch began appearing on curves on several of the major North American user railways in the early 1990s. The problem, which is endemic to heavy haul corridors in moist climates, occurs through a process in which a slurry develops between the rail pad and concrete tie. The pumping action generated by rail traffic abrades the concrete surface, exposing the concrete aggregate. Contact with the aggregate erodes the rail pads and brings the base of the rail into direct contact with eroded concrete. Left unchecked, rail seat abrasion can affect fundamental aspects of the track structure such as track gauge and rail cant. Wide gauge and excessive rail cant — especially outward, or negative, cant — can compromise wheel/rail interaction and ultimately lead to wide-gauge and rail-rollover derailments. The problems associated with rail seat abrasion are exacerbated by the fact that concrete ties typically have been laid in the most severe mainline environments — areas with high degrees of curvature, and in high-tonnage and high-speed corridors. Suppliers have worked with railways over the years to develop a number of solutions, including bonded rail / elastomeric tie pads of varying thickness and hardness, and the use of a steel wear plate that is used in conjunction with rail seat pads to mitigate the incidence of rail seat abrasion. These have helped to slow the onslaught of rail seat abrasion. 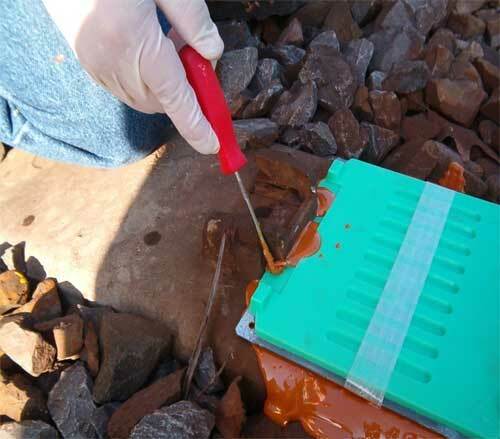 Once abrasion occurs, however, in-track repair methods relying on the use of rapidly hardening materials, such as urethane or epoxy, must be employed to re-establish the rail seat area. And since concrete ties are typically laid in the most demanding, highest tonnage corridors where track time is at a minimum, in-track repair methods must be able to be performed quickly — a tall order in that the fasteners, rail and tie pads must be removed, the rail seat addressed and the track buckled up in the shortest amount of time. The rail seat repair work is performed manually, with hand tools in the field. The work is done out-of-face, typically in three to four 1440-foot long strings. The rail is removed and the rail seats cleaned with a wire brush. The rail seats are blown dry and heated, as necessary. Urethane also creates its own heat, which aids the curing process. At 77 degrees F, the urethane sets up in 60 seconds. The speed is essential to keep the repair process moving within the limited work windows that railways are faced with —especially in the high density, high demand areas in which concrete ties are typically used. The urethane material is commonly laid at thickness of 1/16 to 3/8 inches; it has been laid at a thicknesses of 3/4 inches to 1 inch, Land said. (The material is laid at a thickness of 1.5 mm on new ties.) A hand-held leveling tool is used to re-establish the desired rail cant before the 75- to 85-durometer urethane takes a set. 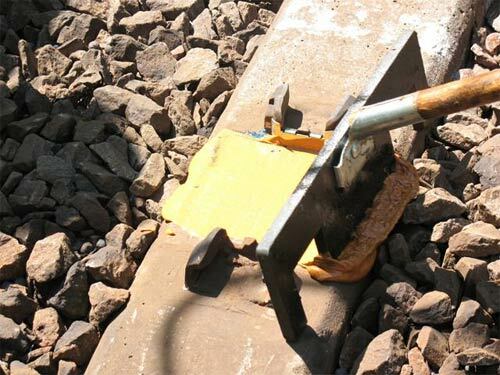 Most railways install a steel plate in conjunction with a rubber pad before reinstalling the rail to mitigate the effects of hydraulic action that inevitably occurs. BNSF has done about 180 miles of repair work in this manner. WVCO Railroad is currently working with a railway equipment supplier and the railway to develop automated equipment that can work in steel-gang fashion to remove fasteners and both rails, clean and pre-heat the rail seats for application of the urethane and rethread the rails afterward. “Railroads and suppliers working together in this way can provide the best ways to solve some of the age-old problems that railroads face,” Land said.